Wealthfront and Acorns are online robo-advisor investment services that can create and manage investment portfolios based on your individual financial goals. Acorns offers a limited menu of exchange-traded funds, which it funds automatically with change from the day-to-day purchases you make through your linked financial accounts, such as credit cards. It caters especially well to cash-strapped college students. Wealthfront is aimed at the hands-off investor who already has a nest-egg but doesn’t want the hassle of managing a portfolio nor the cost of paying a human financial advisor. 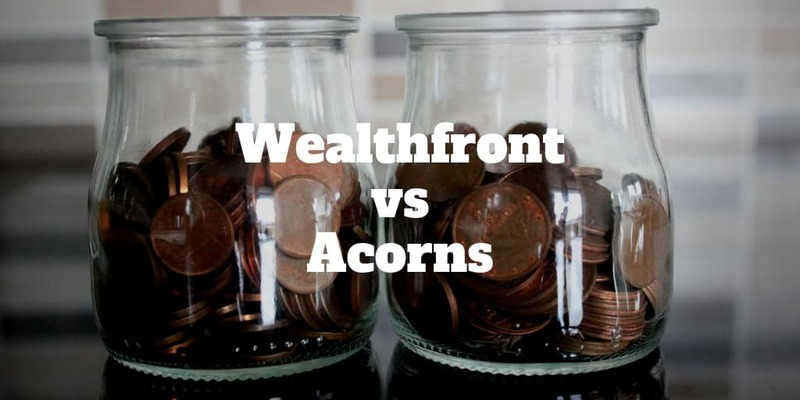 Below we compare Wealthfront vs Acorns to see which comes out on top! Acorns combines automated investing with automatic investment capital collection based upon the amount of your daily purchases. Free to verified college students, Acorns provides an easy introduction to investing if you are already juggling a job, classes and your social life. The Acorns app includes a regular account as well as Acorns Later, which helps you to prepare for retirement. Wealthfront offers automated portfolio creation and management for a wider range of investors. It regularly rebalances portfolios to optimize for investment returns based on your appetite for risk. Wealthfront’s tax-loss harvesting tool is designed to minimize the taxes you pay on your proceeds. Based on a risk-tolerance questionnaire you complete when you establish an account, this robo-advisor assembles your investment package from ETFs in nearly a dozen asset classes. Wealthfront charges 0.25% of your account balance for its services. For example, you would pay just over $2 per month if your account balance is $10,000. The average expense ratio, which is the fee you pay for investment fund maintenance, is 0.08%. Wealthfront does not assess any account fees, transfer fees or annual fees. You must maintain a minimum of $500 in your Wealthfront account to remain active. You can use Acorns free for up to four years while you are in college. Otherwise, you pay $1 a month for a taxable investment account and $2 per month for an IRA with a balance up to $1 million. The expense ratio for your ETF portfolio averages 0.10%. Opening an account is free, and the minimum balance is just $5. You pay no annual, transfer or closing fees. You may be uncomfortable with a high investment minimum that ties up your liquid assets. Because both Acorns and Wealthfront aim to attract all kinds of investors, they keep their minimums as low as possible. Acorns is designed to appeal to cash-strapped college students. Its investment minimum is just $5. If you sign up for automatic purchase roundups, what you buy determines what you invest above that minimum. You have other options, though, such as investing a lump sum or setting up a predetermined amount to invest regularly. Wealthfront investment minimums start at $500. If you have at least $100,000 in your taxable Wealthfront account, you qualify for stock-level tax-loss harvesting, which enables the system to pinpoint more tax-savings opportunities. Should your taxable account exceed a balance of $500,000, you get even more for your money with a service designed to maximize your profitability with an intelligent weighting of securities. One of the top reasons investors choose robo-advisors such as Wealthfront and Acorns is the automation. You don’t need to research, compare or select where to invest because the software does it for you based on the best data available. The basic Wealthfront account is the free PassivePlus package, which offers three different levels of investment tools. The base-level package comes with automatic portfolio creation and maintenance based on factors specific to your profile. You also benefit from daily tax-loss harvesting. The next level up, for those maintaining an account totaling $100,000 or more, includes a more refined tax-loss harvesting tool that not only evaluates your funds but also each stock within those funds for increased tax savings. At this level, you also receive risk parity, a robo tool that helps balance out your investment risk across a variety of asset classes. Smart Beta aims to not only increase your investment yields but also maximize the tax efficiency of client portfolios. The Acorns Core account offers the basics. Once you sign up and link your funding sources, the robo component selects an ETF that best suits your situation and financial goals. It automatically funds your portfolio with the difference between your everyday purchases and the next highest dollar amounts. Acorns Later includes the core account plus a tax-deferred retirement account. The combination account, which includes Core, Later and Spend, adds rewards checking to the equation. Both online investment services offer tools to cut down on tax obligations. Wealthfront employs a multilevel tax strategy. First, it offers various accounts to park the proceeds of investments and defer the taxes on that income until a later date. Wealthfront’s basic PassivePlus account includes automatic daily tax-loss harvesting. One strategy this tax-loss harvesting service uses is selling ETFs that go down in value so that you can claim a loss to offset your gains. The robo-advisor replaces that ETF with another that is performing better, which helps to maintain investment income at a similar or a higher level. If you have $100,000 or more invested, Wealthfront upgrades its tax-loss harvesting service free of charge to stock-level tax-loss harvesting. This tool searches for tax savings not only at the overall funds level but also at each stock within those funds to fine-tune for tax efficiency. Acorns does not offer an automated tax-minimization tool with its investment accounts. It does give you the standard retirement account options. Some people are comfortable trusting the software to adequately manage their investment capital. Others like to have the option of human backup for occasional troubleshooting and advice. If you are in the latter category, you should investigate SoFi Wealth or Betterment. Acorns offers customer support by phone during regular business hours. And it has an online help center containing articles, FAQs and tutorials for using the site. You can also fill out a contact form with a specific question, and you will receive an email response within a couple of days. Wealthfront offers a phone help line to registered users as well as a contact form for specific email inquiries. Similar to Acorns, its help center includes FAQs and articles on various relevant topics such as tax-loss harvesting basics and account funding. Neither robo service makes financial advisors available because they deliver a fully automated investment experience. They make all your investment decisions for you based on your particular information, eliminating the need for expert advice. If you do have a complicated financial situation, the leader when it comes to dedicated personal advice plus automated money management is Personal Capital. Even though you need not lift a finger in selecting your investments or initiating trades, you can still benefit from tools that help you get the most for your money. Acorns offers Found Money, a purchase discount tool that puts cash into your linked Acorns account when you make purchases from about 100 different partners. The robo-advisor also publishes Grow magazine online which features a variety of investment-related and personal finance articles. One of the premium tools Wealthfront provides to users is the Path app. It crunches your data to help you get a handle on retirement, a home purchase or your child’s college fund. The Time Off for Travel app helps you to decide on how much time away from work you can afford to take, how much you can spend on your vacation and how all this will affect your long-term financial goals. The site also provides a simple calculator that shows you your monthly fee according to your account balance. Ideally, a robust portfolio includes a balance of securities from different asset classes. Any good robo-generated portfolio should contain a diverse selection of investments. Wealthfront draws from 11 asset classes to build your custom portfolio whereas Acorns offers a smaller selection. The mobile Acorns app is well-designed and very easy to use. It offers the same full range of functions, from banking to monitoring, as the desktop version. It comes in both Apple and Android formats. This is also true of Wealthfront’s mobile app. Additionally, Wealthfront’s Path and Time Off for Travel apps offer services not available with Acorns. Wealthfront is the clear winner in terms of tools, diversity and scalability. Its daily tax-loss harvesting function offers you a distinct advantage when tax time rolls around. If you are in college and want to get a head start on your financial future, Acorns represents a simple, low-cost pathway into the investment environment that is fee-free for up to four years. If you are not a student and have some capital to invest but want to bypass the learning curve and get straight to the rewards, Wealthfront may be a better choice for you.